This past Saturday evening I had a Stamp Studio Blessing. I purposely planned this for the eve before the "Grand Opening" of my new stamp studio. 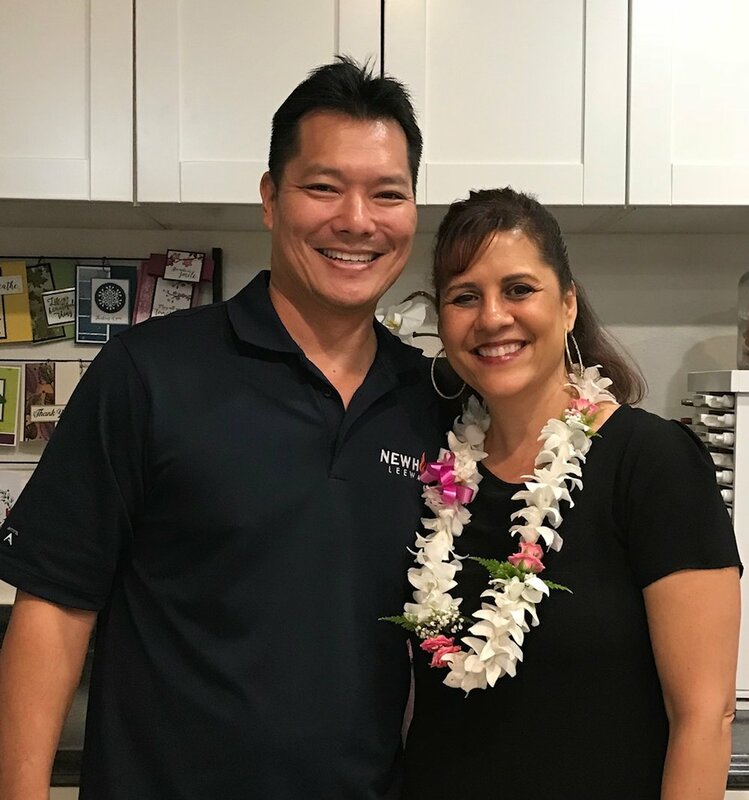 The blessing was led by one of my dear friends, Pastor Alec Shimizu from New Hope Leeward, who is like a brother to me. Alec has always been an encouraging friend but during my recent diagnosis with breast cancer he was especially caring and supportive and for that I am so grateful. As we discussed what would take place at the blessing, Alec explained that he would open up with prayer and then ask me to share a little about my history as a Stampin' Up! Demonstrator. Some of the things that came to mind was how I had initially started just to get a discount on product. Then I remembered all the other blessings that have happened such as traveling the world and making amazing friendships. While all of these things have been amazing parts of my journey, the purpose behind why I do what I do is so much bigger than that. I was reminded of that purpose the day before my blessing when I visited the YWAM base with two friends who were classmates of mine 30 years ago. We attended a Discipleship Training School in the late 80's. I hadn't seen one of these friends in 30 years so we all had a lot of catching up to do. As we reminisced we spoke of a time when a lady named Diane Littleton came to pray over us. After Diane would pray over each student she would share about what God spoke to her as she prayed. As she prayed for me she said, "I see you surrounded by hundreds of women, you are being an influence and encouragement to them". When she was done I smiled and inwardly thought that she must have gotten that message about someone else because I am not someone who is comfortable being in front of a large group of women and I didn't feel a call to be involved with women's ministry. Then I thought about where I am today. Through my experience with Stampin' Up! I AM surrounded by hundreds of women. Amazingly beautiful women who are my customers, downline, sidelines, sister demonstrators, wonderful family, and amazing friends. What Diane prayed has come true. It made me think that sometimes we don't think we have the ability to do something, but with God's help, we can overcome those insecurities and fears. I love the fact that God led me in a very creative format to show me how he could use me to bless others through sharing inspiration and creativity with ink and and paper. I love what I do and hope I can be a positive influence and encourager to everyone I meet. For my new space, that is my hope. I want to be more intentional in helping others as God leads me to do so. I want to make a difference. As we closed our time together, Alec had us all go around the room and pray. We prayed over every inch of this new space as you can see in the photo below. Even as I look at this photo of this special moment, I am reminded of the peace and joy that fills this space. I love how everyone, young and old are smiling. It is my hope that everyone who steps foot in this space would feel loved and encouraged as they create projects designed to encourage them in the process and bless others when they are used. Alec closed with a prayer of dedication and then we enjoyed dinner and fellowship. It was good to have my sisters here to celebrate with me. I love how we share so many different life experiences together. Karin and family brought the beautiful lei I am wearing. Karin said she picked an orchid/rose lei so I could wear it at my open house the next day. Cindy and family brought me this beautiful white and gold pineapple. What a special momento to commemorate this special day. Someone recently asked me why I like Pineapples and I told them it was because they represent hospitality. I hope that everyone who comes into my home and studio will feel welcomed, taken care of, and loved. 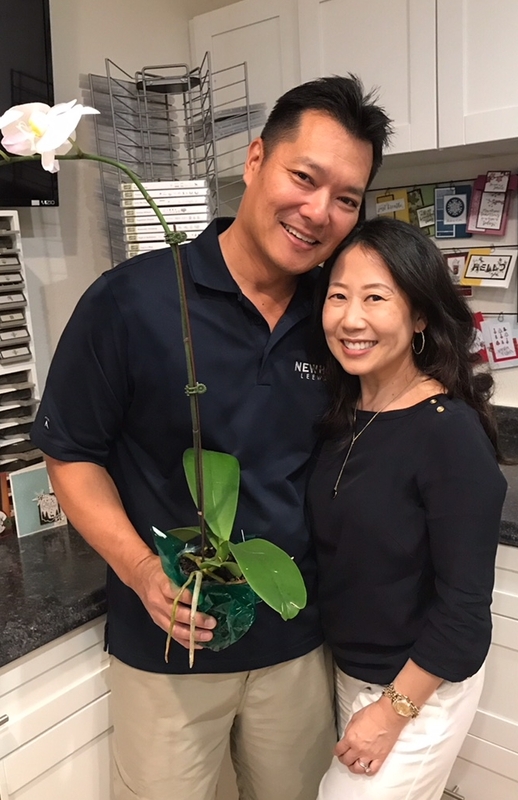 Alec and Lynne blessed me with this beautiful orchid. I hope to make a card for them inspired by this beautiful gift. I am very thankful and blessed to do what I do as a Stampin' Up! demonstrator. I love that I have a job I can use to not only be creative but to inspire others, encourage others, and do my best to make a difference. I am thankful for this new space that has been dedicated to God because I recognize all that I have, all that I am is because of Him. So, do you want to see my new space? Since some of you have asked. Here are a few photos! The counter and cabinets on this wall are all new. There is lots of storage both in the tall cabinets and in the deep drawers. The ink pad holders are old. They were custom made in Hawaii many years ago by Randy Pang. I just painted them white to match my decor. The dry erase boards at the back of my studio were made when I took the existing tall cabinets and turned them around to provide hidden storage behind this wall, I then used the back of the cabinet as a dry erase board by adding a panel that could be used this way. This has been really helpful in keeping me organized. 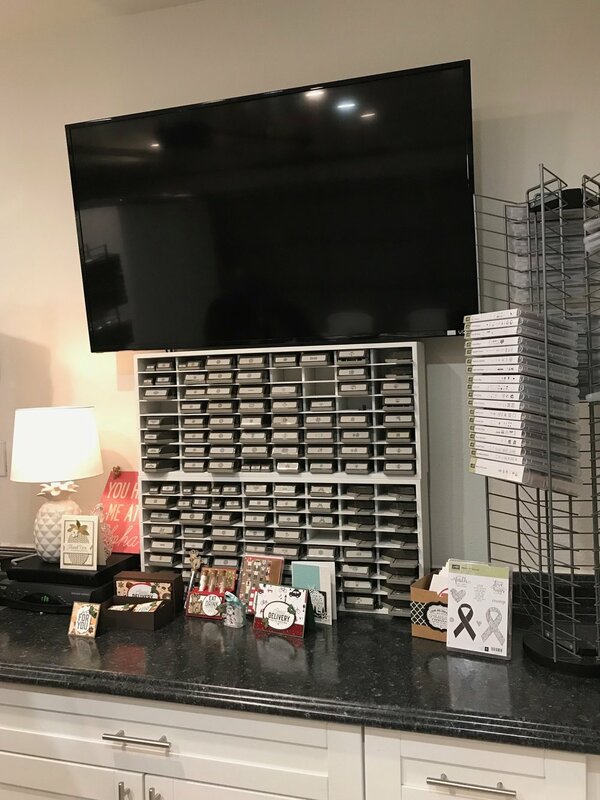 The paper storage pictured here is from Stampin' Storage. A wonderful company that creates custom storage units for crafters. The middle drawer has a pull out section where all of my scrap paper is kept in hanging file folders. On this wall I have all my punches in a punch unit I purchased from Stampin' Storage. My stamps are stored on CD racks my friend Cindy found for me years ago on Craig's List. The large TV is great for playing the music station during a class. I also like watching tv sometimes when I work, its usually Hallmark Movies or Football. Yep! I love them both. This hidden desk area has another small card rack where I store personal cards that are ready to send. I also have a business supplies tucked in these older cabinets that I moved to this area. 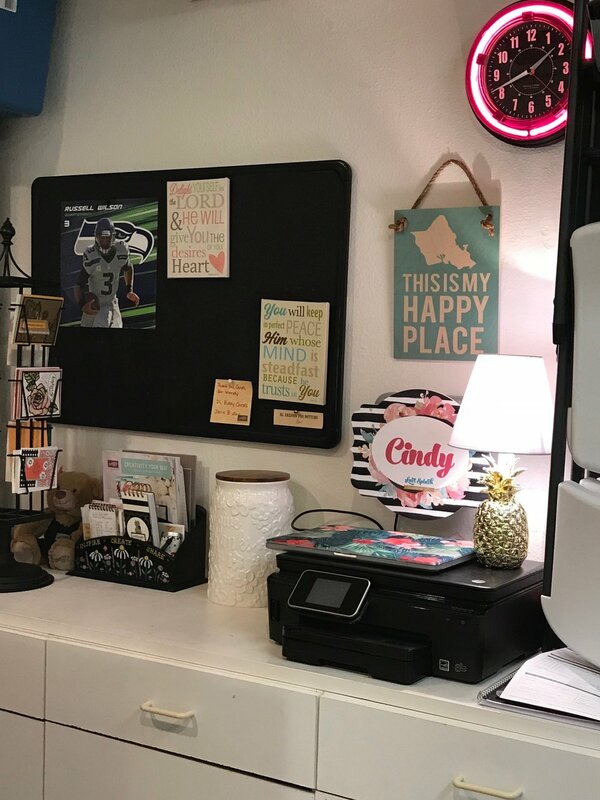 To save space I hung extra chairs on the wall and I have a bulletin board where I keep some encouraging words to look at as well as a photo os my favorite inspirational quarterback, Russell Wilson. This wall contains card samples where I can show my customers what is coming up. The cards in the middle will be my next stamp a stack class which is this Sunday afternoon at 2pm. One of my favorite things in this space is this custom sign by Soha Living. Its a fun way to remind people of the positive spirit I hope will invade this space. Well, in my next post I'll share a little about my Pink With Purpose Event. Although I don't have any card samples to share with you today, I hope you enjoyed a closer look at my new space. Thanks so much for taking the time to read this post and allow me to share about my Studio Blessing.